David Frederick Riley’s contemporary animal portraits bring a new light and spirit to western wildlife. Riley has lived in the west for over a decade, and lets the animals and history of the area inspire and guide his work. 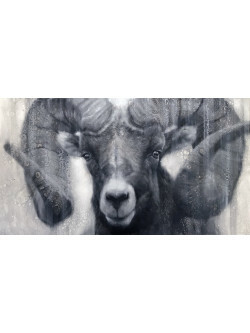 He uses additive and subtractive painting techniques to build up layers of paint that seamlessly combine beautiful abstract work with realistic animal portraits. David will be debuting new works at Meyer Gallery during the Park City Arts Festival, and providing a special demonstration of his techniques on Saturday August 4th, from 12 – 4 pm. Riley’s paintings manifest his capability to capture the spirit of his different animals, which gives them an even more realistic and lifelike quality. He is able to counter this realism with unique abstract backgrounds that create an ethereal dreamlike state which the animals exist in. The juxtaposition of realism and abstraction is incredibly refreshing and creates an enchanting image of the animals of the west. Riley has been a finalist in the Art Renewal Center Annual Salon, the Oil Painters of America National Juried Exhibition, and was in the top 100 finalists in the prestigious London BP Portrait award. His popularity as a distinguished and skilled artist has inspired many questions regarding his techniques. Riley is excited to answer these questions with his demonstration during Park City Arts Festival, and show how he combines his foundational painting skills with other unique practices in order to create his beautiful wildlife images.